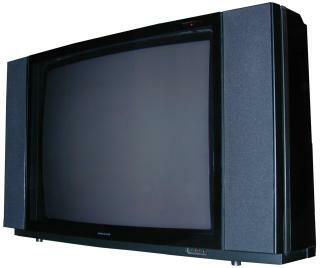 The Beovision LX 6000 was the largest set fitted with the second version of B&O’s “unity” chassis (see the Beovision MX 4000 for a more detailed description). This set was also the last model in the range to be offered in a cabinet with real wood inlays, after its withdrawal only plastic and painted finishes were offered. Text copyright © Beocentral. Unauthorised reproduction prohibited. Though it lacked the active loudspeakers and high-power amplifiers of the Beovision MX 7000, the large drive units (in bass-reflex cabinets), two-way design and wide spacing of the Beovision LX 6000’s loudspeakers meant that this model was still the choice if good sound was a priority. Text copyright © Beocentral. Unauthorised reproduction prohibited. The Beovision LX 6000 was the last Beovision in a line of slim, elegant sets that combined high-technology with traditional materials. It was the last that really fitted in with typical décor rather than clashing with it and was a real loss when it was discontinued. From then on the mainstay of the upper end of the Beovision range would be bulky widescreen sets in shiny painted cabinets, designs that only blended well with modern furniture. Text copyright © Beocentral. Unauthorised reproduction prohibited.